On November 12, the relics of the Blessed Martyr Vasyl Velychkovsky, who headed the UGCC during its underground existence, will be brought to the Patriarchal Cathedral of the Resurrection of Christ of the UGCC in Kyiv. The event dedicated to the commemoration of the Blessed Martyr will take place after the third Liturgy, which begins at 11:00, the Department of Information of the UGCC reports. The faithful and guests of the cathedral will be able to find out about the life of Blessed Vasyl during the underground activity, his defiance of the regime of the then government, watch a scene from the prison life of the holy martyr, and also get inspired by the spiritual singing of the MetaNoya group. The special moment of the event will be the testimony of the family of the Blessed Vasyl - Iryna Kolomiets and Cornelia Petryshyna. 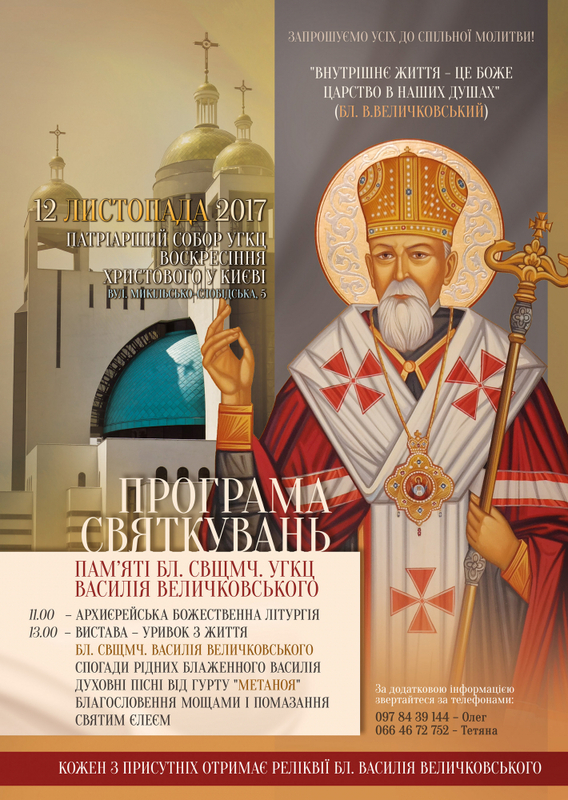 The program of the event was developed by Tatyana and Oleg Chiharivskys, spouses from Lviv, who are engaged in the spread of worship of the Blessed Vasyl, in cooperation with the Redemptorist sisters and the brothers of the Kyivan Three-Saints' Theological Seminary.